Fly-tipped waste. Photograph: Damian Rafferty. 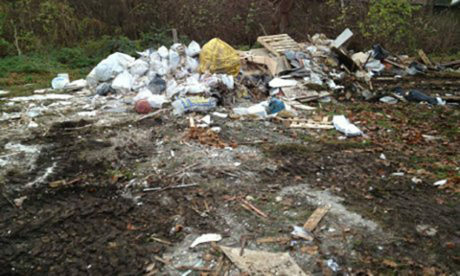 Hackney Council has admitted losing track of the amount of fly-tipping taking place in the borough. The admission was made when statistics for fly-tipping across England released in November appeared to show recorded incidents jumping from 3,267 in 2016/17 to 9,821 in 17/18. However, when quizzed on what was driving the sharp spike, the Town Hall conceded that, partly as a result of a restructure in the environmental services department, figures for 2016/17 are not to be trusted. A spokesperson for Hackney Council said: “There has been considerable change over the past three years within the council’s environmental services after we successfully integrated our street and estate cleaning teams. “This project, in 2016/17, was extremely resource-intensive and reduced our ability to collect data on the number of fly-tips in the borough. “The figures therefore suggest there was a decrease in fly-tipping from the year before. However, we do not believe that this was the case in reality. “In 2017/18, full data collection was reestablished and we also included fly-tips from estates in these figures for the first time. The Town Hall has now pledged to make “every effort” to accurately and consistently record fly-tipping incidents in Hackney, in order that the levels can be properly compared year to year. It is the council’s belief that there has not been a “significant fluctuation” in fly-tipping since 2016/17, as the tonnage of rubbish collected has remained consistent. This would put the correct amount of incidents closer to the 9,821 currently recorded for 2017/18. Darren Martin, vice chair of the Hackney Liberal Democrats, said: “It is apparent that the council is not taking fly-tipping seriously given their admission that they have not been keeping track of incidents accurately. “There were 9,821 incidents of fly-tipping in Hackney last year, the council say they do not believe this is an increase but cannot say for sure. Martin went on to criticise the council’s recently introduced bulky waste charges of up to £60 as potentially “adding to the problem”. The Town Hall defended the introduction of the charge, pointing out that the charge goes towards waste prevention, recycling, and waste and cleansing services provided in Hackney.